Hell hath no fury like a Facebook scorned. In today’s digital age, most of us assume everyone understands this fact. But every now and again, people surprise us. An ever-increasing element of this reality is that the hounds of Reddit, the Twitter armies, and Facebook vigilantes are more than willing to remind people that we live in a publicized world. You can’t hide behind privacy statements or legal jargon or appeals to company policy to pacify an Internet mob. Once you cross the line of Internet etiquette, the people of the World Wide Web will hunt you down and do their best to ruin you forever. 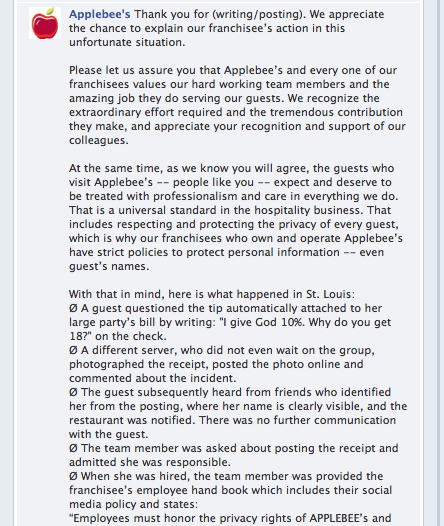 A waitress at a St. Louis Applebee’s lost her job for posting online the receipt upon which a pastor had declined to leave a tip, with a snarky note saying she gave God 10 percent. After her dinner on Jan. 25, Pastor Alois Bell crossed out the automatic 18 percent tip charged for parties of more than eight. “I give God 10% why do you get 18,” she wrote above her signature. Employee Chelsea Welch — a colleague of the stiffed server — took a picture of the receipt and uploaded it to the online site Reddit. She subsequently lost her job, an Applebee’s spokesman confirmed to TheSmokingGun.com, for violating a customer’s privacy. Yesterday on Fox 2 Now, the pastor issued a (sort of?) apology. All this information, of course, is so yesterday. “Pastor gets server fired” was Chapter One in this strangely entrancing saga, on par with a slow-motion train wreck from which you cannot tear away your eyes. Chapter Two is where Applebee’s apparently wants to commit suicide in front of our digital eyes. 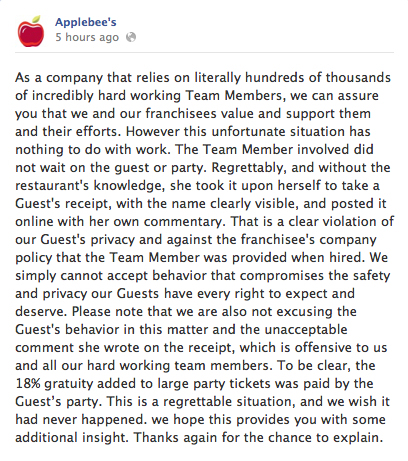 Applebee’s social media team decided to respond to the growing clamor by saying, “We wish this situation didn’t happen…Our franchisee has apologized to the Guest and has taken disciplinary action with the Team Member for violating their Guest’s right to privacy.” Around midnight last night, the reaction against this status had grown to a frenzy. There were well over 10,000 comments on the post, most of them negative. I was, to put it plainly, stunned. 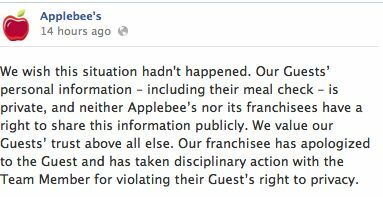 Surely this was someone using a fake Applebee’s page to make a comment. Commenting on your own status update during the biggest PR disaster in the history of your company at 2:53 am is the exact definition of social media suicide. 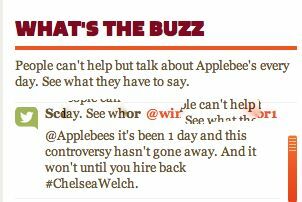 Assuming this was a fake Applebee’s account, I clicked on the name. It took me right back to the page I was on. This was an official Applebee’s person. Commenting at 2:53 am. But that, readers, is just the beginning. Oh it gets better. So much better. Legitimate points. I mean, you can’t drop an official response in the middle of post that’s expanding 1K+ posts an hour. It becomes nearly impossible to find after 5 minutes. This now prompts people to comment on both the original status update as well as the new status update. I went to bed at 5 am. As of 5 am, the original status update had 19,027 comments. As of 5 am, the new status update had 2,111 comments. As of 8 pm when I write this, the tallies for comments are as follows: the original post, now deleted, was at 19,027 when I last saw it; the second post is at 11,216; the third post is at 11,035. That’s 41,278 mostly negative comments — and who knows how many more there were before Applebee’s started deleting comments, not just posts. I wonder why Applebee’s just doesn’t disable comments at this point. 1. 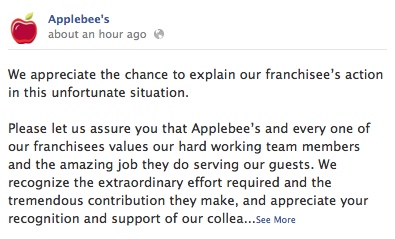 Readers have pointed out to me that Applebee’s did not delete the original post. 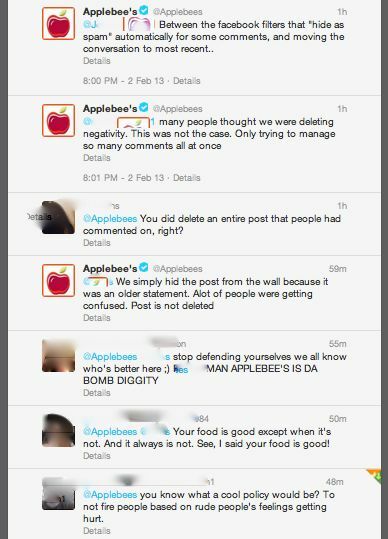 Allegedly Applebee’s “hid” the post here. 2. 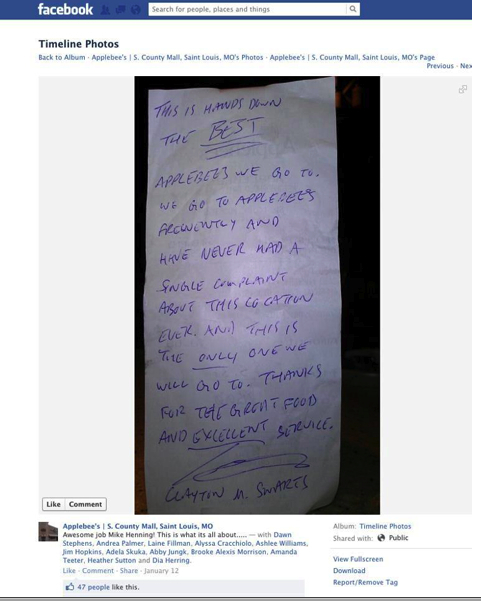 If You Can’t Afford to Tip… informed me that they took the original screen shot of the other receipt that allegedly Applebee’s had posted and then deleted. You can view it on their Facebook page here. I changed the original post to reflect that, and am restating it as an update as well. 3. Did Applebee’s block me? 1. 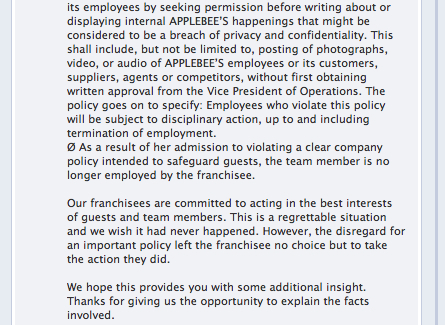 As of 4:45 pm today (02/04), I was told (and verified) that Applebee’s has made public the previously hidden post. 2. This story now has over 1,400,000 views. Pingback: ARCOMPANY | Social Judge, Jury & Executioner: Do Social PR Disasters Really Affect Sales?